Gather the ingredients. Then read the secrets found here. Boil quinoa according to package directions. Cool it in fridge or freezer. Prepare the vegetables. Wash and clean the kale, dice cucumber and red onion. Drain black olives and slice in half. Mix all the ingredients for the dressing. Shake it well. When the quinoa is cooled, mix it with all the vegetables and the dressing in a large bowl. 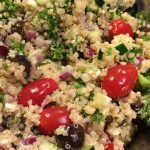 The ingredients for this recipe can be prepared in any order, but I recommend cooking the quinoa in advance, so that it has time to cool before combining everything. The Classic Greek Salad Dressing is versatile for just about any salad. Many other Greek salad dressing recipes do not have lemon in them or basil. The difference in taste is huge, With lemon and with basil they cut down on the sour flavor the dressing might have otherwise and actually makes the flavor more balanced for a more clean and refreshing taste.